Once you have found your perfect wall mural from the thousands available here at ohpopsi, you just need to follow a few simple steps and tips to ensure a perfect fit. All our 'Made To Measure' wall murals are printed to order, so the measurements you give are the size we print the wall mural. Decide which wall you want your mural to go on and which section of the wall you want covered. Handy hint: A wall mural looks fantastic and will add drama to any room. Just remember to think about the placement of your furniture…our handy scaling tool lets you position your chosen image in your wall space so you can be sure your sofa won’t cover up your favourite part of the mural. Width: Measure the horizontal distance from the left hand side to the right hand side of your wall. Be sure to measure at the widest point of the wall to ensure the wall mural covers the whole wall area without leaving any gaps at the edges. Height: Measure the vertical distance from the top of the wall to the bottom. Handy hint: Because most walls aren’t perfectly square, we suggest you measure the height of your wall in a few places. 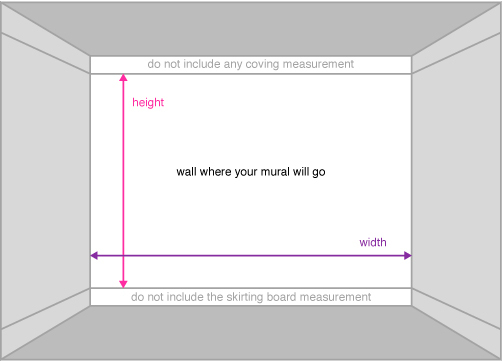 If the measurements are different, ensure that you use the 'add trim' option when ordering your mural. This will ensure you won’t end up with a gap at the edge of your mural. Top tip: Be sure to exclude any coving and skirting boards from your measurements. If you only want a section of your wall covering with a mural, simply measure the exact width and height of the area you want the mural to cover and enter those measurements when placing your order. It’s as easy as that! Just one more thing….there are no minimum or maximum sizes so you can have any size mural you want We think that’s pretty wonderful!.